City Index by Gain Capital, is an international Spread Betting and Forex broker. Founded in 1983, they are a global brokerage firm, with local offices in many countries including; Australia, United Arab Emirates and Singapore. Their main address is at: Park House, 16 Finsbury Circus, London, EC2M 7EB, United Kingdom. Contact phone numbers are: United Kingdom; +44 203 1941801, Australia; 800 354 182, and Singapore; +65 6826 9988. Their primary email address is: support@cityindex.co.uk. Official website: CityIndex.co.uk. Investors and Traders at City Index can use the AT Pro, Advantage Web, MetaTrader 4 and their Mobile Apps for iOS and Android. It is safe to say that the AT Pro trading software is a prime reason investors are trading with this broker. With the AT Pro software, you can code your own trading strategies, and back test their performance. Advanced charting capabilities are built into it, also with ready made Auto Trading strategies for Forex trading. In November 2018, City upgraded their WebTrader software to the new HTML5 standard. It features advanced charting abilities, with customized indicators and tools for drawing. 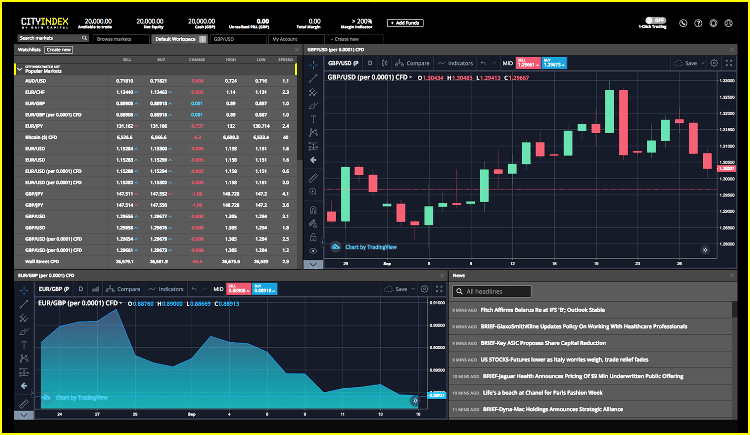 You will have access to hundreds of underlying assets to trading including; Bitcoin, Global Indices, International Shares, Forex pairs, Commodities, Bonds, Options and more. Spreads on Forex pairs is as low as 0.5 points, and on Bitcoin the spread is $70. Minimum deposit for a new account is $210, and you can test them with free demo account, see here. City Index is licensed by various financial regulators depending on your country of residence. Experienced traders already know the benefits of using a broker that is licensed and regulated. By using a legitimate broker, you can be assured that funds are kept in segregated accounts. GAIN Capital UK Limited is regulated by the Financial Conduct Authority, with register number: 113942, see here. GAIN Capital Australia Pty Ltd is licensed by ASIC with license numbers ACN 141 774 727, AFSL 345646. GAIN Capital Singapore Pte Ltd is regulated by Monetary Authority of Singapore (MAS) with Company Registration number: 200400922K. With the recent volatility in the Forex markets, traders are now very much aware of the importance of only trading with a licensed and regulated Forex broker. There are many CFD brokers available to compare and choose from online. You can find the reviews of other high quality Forex brokers here. ForTrade are the best Forex brokers in England, since they are local and licensed by the FCA, see here. Try a Free Demo Account on their amazing trading platform, signup here.